Case Study. Utah Junior High adds fire rated glass to corridors. 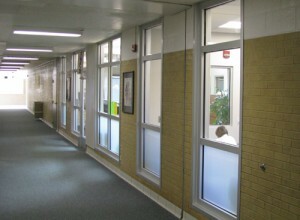 During renovation of North Layton Junior High, architects added fire rated glass in 1 and 2 hour fire walls adding daylight and providing an open, welcoming entrance. AJC Architects of Salt Lake City, Utah looked to SAFTIFIRST when it came time to renovate the media center and build a new counseling center for North Layton Junior High School. 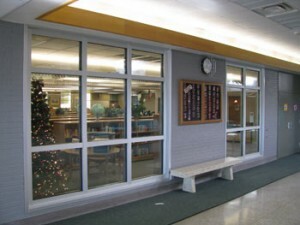 They realized they could take advantage of a clear fire-rated glazing to keep the look of the media center and provide an open, welcoming entrance to the new counseling center. Prior to the renovation, masonry and non-rated hollow metal storefront and glazing were used in the building. Due to the increased square footage of the building, new fire rated areas needed to be created, says Jodi Geroux, AIA, LEED AP of AJC Architects. The existing hollow metal storefront glazing was located in walls that needed to be upgraded to 1 and 2 hour fire walls. To achieve this, the design team chose SuperLite II-XL and GPX Framing by SAFTIFIRST to meet the code requirements and maintain the building original design, which incorporated a lot of glazing. SuperLite II-XL is fire rated up to 2 hours with hose stream, impact safety rated to CPSC Cat. II, and meets ASTM E-119, the stringent wall criteria limits the average glass surface temperature rise to 250 F on the non-fire side. ASTM E-119 performance standards apply where fire ratings of 60 minutes or more are required in order to protect against dangerous radiant heat and provide a safe path of egress in the event of a fire. Tested and approved in large sizes, SuperLite II-XL can be combined with GPX framing to provide wall-to-wall and floor-to-ceiling expanses of glass that provide beauty, elegance and maximum fire safety. In addition to these benefits, the competitive pricing of SAFTIFIRST glazing system easily met project budget requirements. See more photos of this renovation for views and safety in Glass Magazine. We are happy with the way the project turned out, says Jodi. While we did not require much support for this project, we will look to SAFTIFIRST for help in specifying fire rated glazing products for future projects.